Don't get confused by the web cams here: Venice is a city to dream of, but consider that too pinky shadows are only due to the lenses :-) From time to time these web cams may not work properly. At the moment of writing, they are ok and in good health, and they do refresh when they have to, normally every 60 seconds. A manual refresh (F5) may help if you see that the scene remains static for too long. 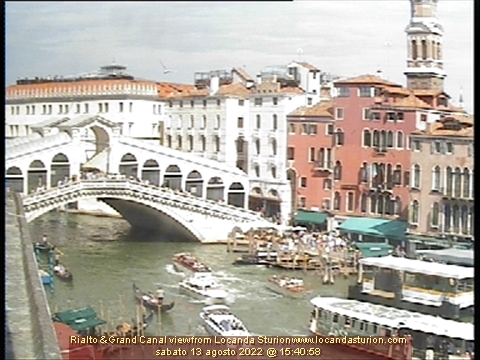 Locanda Sturion's webcam may show some problem with colours, but the view is fantastic: again the Grand Canal, near the Rialto bridge. So... enjoy! We'll be pleased to hear from you about correct refreshing in your browser.